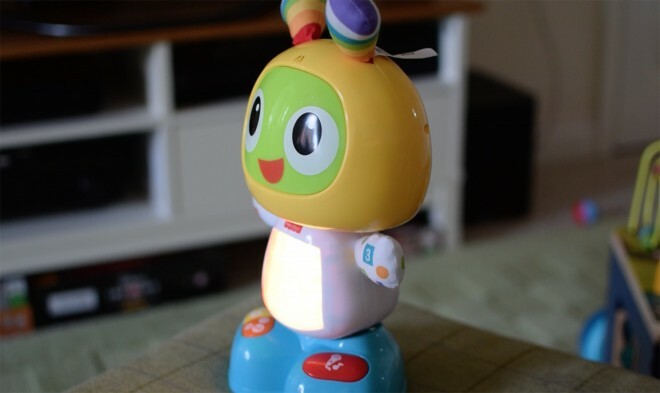 This month Taylor has been testing Bright Beats Dance and Move Beatbo baby toy from Fisher-Price and putting it through it’s paces. 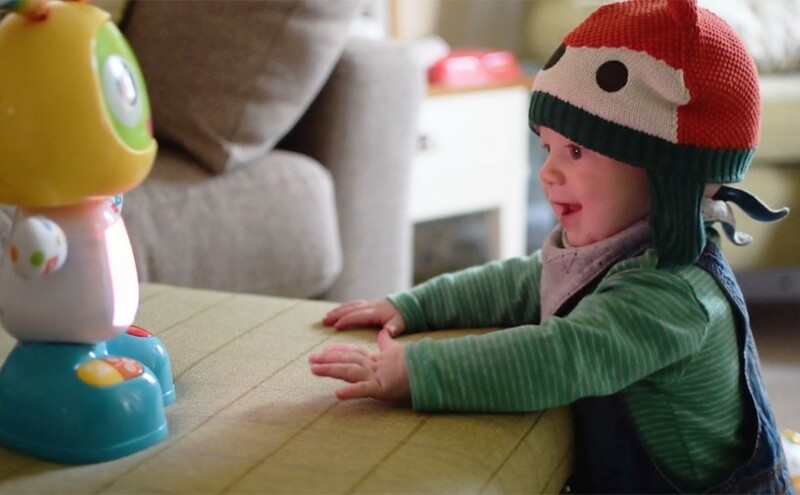 Beatbo is an adorable interactive robot and soon became Taylor’s favourite toy to date. 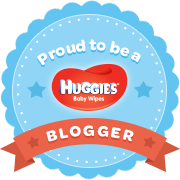 It even saw him playing in the playpen for more than 5 minutes without getting bored and crying – now that’s an achievement! Having just turned 9 months, Taylor can enjoy playing with his Beatbo for a long while yet. 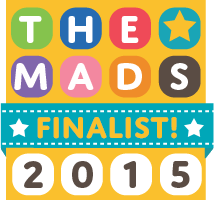 Not only is it engaging and fun for little ones with it’s dancing and colourful lights, it is also educational. 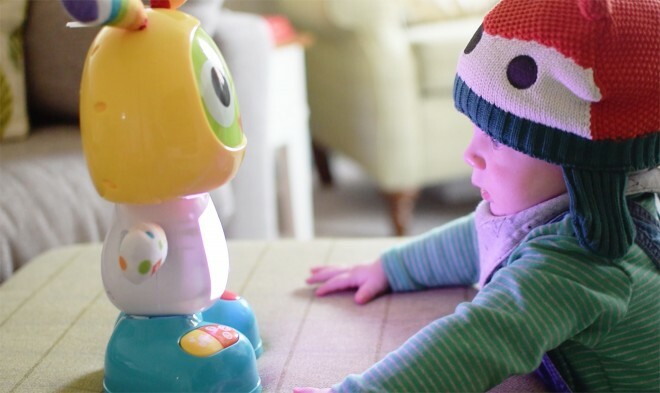 As Taylor develops, Beatbo can teach him letters, colours, counting and more with his 3 modes of play. 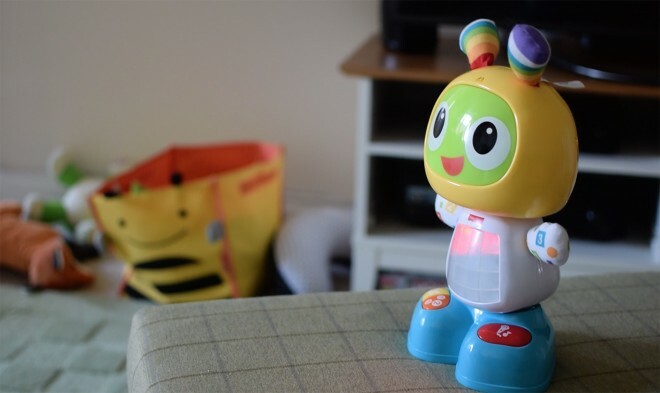 Each mode is easily activated at the touch of the large colourful buttons on Beatbo’s feet or with a press of his multi-colour light up LED tummy. Beatbo requires 4 x AA batteries and to every parents delight this Christmas they come included, so you can start to boogie straight out of the box! 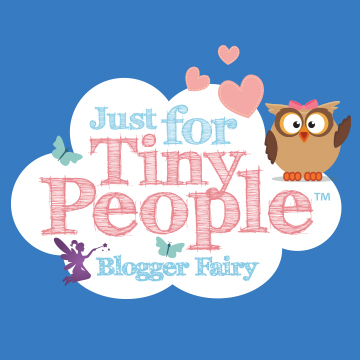 This mode encourages little ones to get moving and is the most age appropriate mode for Taylor to try at the moment. When in action, Taylor stomps his little legs, waves his arms and shouts with joy as he watches Beatbo bob his head and sway his hips. He gets so excited watching Beatbo, it’s wonderful to watch and we all love to join in! Learning and games mode is brilliant for when Taylor is a little older. 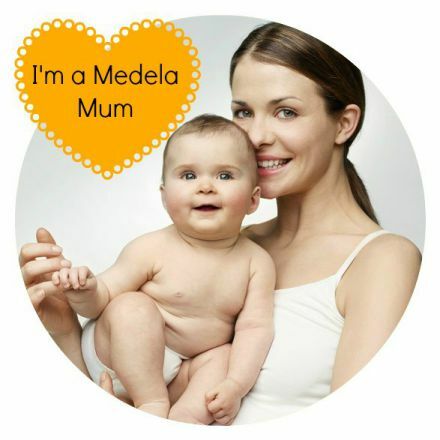 Having him hear the letters and numbers from an early age will encourage him to learn them sooner and we love singing the ABC song whilst pulling funny faces – it’s very catchy! Everyone loves a sing-along! This mode allows you to record a phrase and Beatbo will remix it and sing it back to you. You can imagine we’ve had fun saying all sorts of silly things in this mode and having it rapped back to us. Although Taylor doesn’t understand this mode fully yet everyone else has had a giggle using it. Since the moment Beatbo came out of the box, Taylor was waving his arms in the air and smiling with excitement. It didn’t take long for him to learn how to operate it and he can now push the buttons by himself meaning he can play independently. 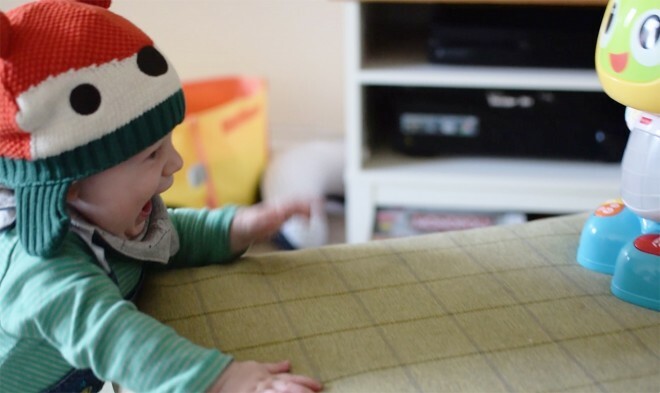 His favourite is to crawl around the house whilst dragging Beatbo along by his ears – so cute! Overall, we all love this bright colourful little robot, from the way he bobs his head and sways his hips to his little light up tummy. 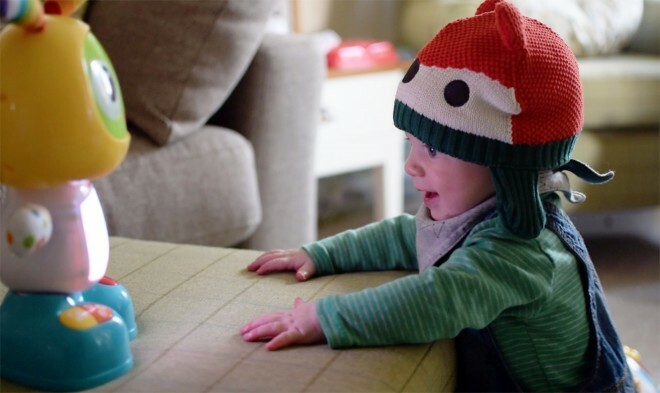 Beatbo is a really fun baby toy and certainly one who will be popping up on Christmas wish lists nationwide this year. Want a Beatbo of your own? You can purchase your very own Bright Beats Dance and Move Beatbo dancing robot here! Oh my niece would love this. She’s a little mover and shaker so she is. It looks ideal for a little that loves to dance. It certainly looks like Taylor had a lot of fun with this new addition to the household! Baby L is 8 months and would love it. Although I’d imagine DJ would borrow it, he’s very good at sharing his younger brother’s toys! those pictures are adorable! he really is engaged! love to see the concentration on their faces when they’re captured by a toy like this. Oh how cute! And adorable that Taylor dances along with it 🙂 I haven’t seen this toy before, but I’m sure Ayden would love it too. Looks like a very multi-functional toy! 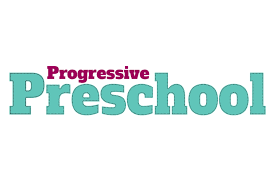 I love kids toys that are interactive and encourage education. oh my gosh those photos are to die for! his little face! … if any face could make me buy a bright-beats dance thing it would be that one! My children are too old for such things now though, but I have already thought of a baby due to be born soon so I can buy it for that lucky little boy/girl. Aw, love Taylor’s hat. He looks so cute watching and playing with the Beatbo. Sounds like it’s a useful and fun toy. Beatbo looks so cool my little sister would adore this especially if it dances as she likes anything that moves. She would see it as a sensory delight. HAHA look at his little face he loves it. I remember when Hayden was this small… Now its all about the iPad. £34.99 isn’t a bad price either… I know someone who would love this as a birthday present. 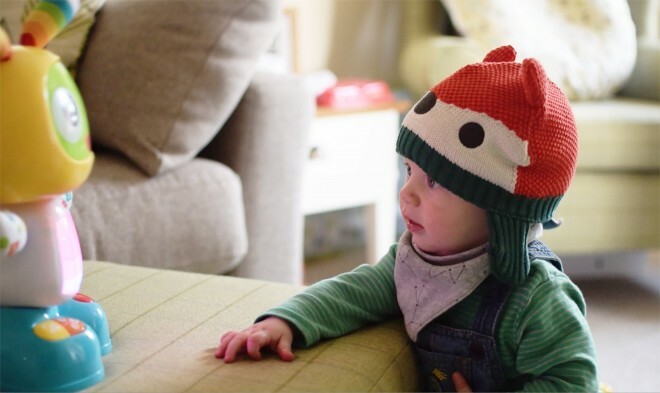 The Beatbo looks great and sounds like loads of fun and the pictures are adorable – Taylor looks totally engrossed in his toy and I love his little hat.